and can be tailored to your specific needs. As experienced event professionals, we can help develop event strategies that make sense for your organisation. We observe your event objectives and target demographic and help design event plans, create budgets and propose ideas that are suitable and feasible for you as an organisation. Understanding the significance of time lines when planning an event is imperative. We prepare detailed time plans indicating the critical path to success as well as realistic budget plans. Getting funding for an event can be a challenge. Royal Blue Events will work with you to design a suitable sponsorship package and devise a strategy to approach relevant sponsors. On the flip side, perhaps you are a new event sponsor and would like to activate your onsite presence. We are creative and logical thinkers and can work with you to make your engagement ideas a reality. The initiation of creative marketing activities can lead to a successful event. We can help develop an event marketing strategy that is appropriate for your event objectives as well as your target audience. We assess all opportunities to help drive ticket sales and build awareness across various platforms. We can help design a suitable event program that carries weight and interest for your target audience. From presentations, speaker liaisons and contract negotiations to entertainment ideas and coordinating all the relevant logistics. We are connected with the most reliable suppliers in the industry (venues, caterers, AV teams, rentals, props etc). There are a number of factors to consider when selecting appropriate suppliers. We assist with contract negotiations and the logistics to ensure a cost effective and feasible selection. 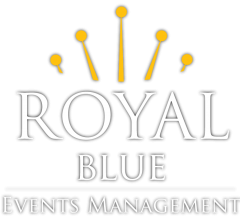 Royal Blue Events can help develop a strategy and coordinate the design and production of all event paraphernalia including invitations, website, tickets, banners, signage, program guides and more. We are not afraid of tech. Actually, we are quite tech savvy. We work with numerous tech suppliers to incorporate technology at events that will help enhance the guest experience including mobile apps, live streaming, projections and more. Paying attention to all the little details has a huge impact on any event. Not only can we help create exciting event design concepts, we can help bring these creative ideas to life. We will prepare mood boards, arrange for props and source rentals to make the concept a reality. A well-planned event will ensure attendees have a great experience. Royal Blue Events can assist with the development of a detailed production schedule to make sure the event flows effortlessly and is enjoyable from start to finish. We can also help create scripts for speakers and emcees. Planning any event takes time, skill and a lot of energy, however coordinating an event on the day is even more demanding. We manage onsite teams and coordinate the logistics and flow on the day so that you can focus on your business goals and enjoy the experience with your guests. A post event report which details the overall achievements, opportunities and suggested improvements. We also review all event expenditure against revenue and track the status of any outstanding invoices. This also includes a review of processes and templates for continued success.